Christin Doran began her career in publishing nearly 18 years ago. After a year spent in the finance sector of the business, she quickly and eagerly moved into sales support and circulation development. It was there she found her passion, working and helping the customer. Her motivation and commitment was apparent; to provide the best possible service and solutions to her customers. After several years leading the sales support division, Christin decided on a sales career and has continued to follow that path. 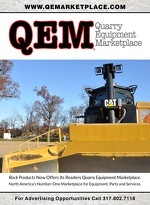 In January 2011, Christin made a decision to join the Mining Media International sales team, working primarily on its new launch, Quarry Equipment Marketplace (QEM), along with other Mining Media products. " I couldn't be more impressed with the company's dedication to the mining and aggregate industry and its commitment of producing only the highest quality publications. I'm excited to be a part of this organization and to continue working in this industry. I invite you all to join us for a successful and exciting 2011, with many more years to follow!" said Christin.